A customer wants to have a fully automatized process so the operator won't have contact with the blasting process. Parts must be blasted controllable and without mistakes, with gentle roughening for better adhesion of paint. We have designed a cell with a turn station. 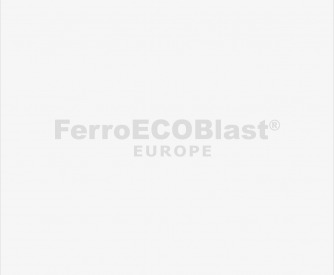 Blasting cell has pneumatic collecting and recycling of abrasive. Manipulation of a part is automatic on hang transporter. The cell has 1 robot with two nozzles, but there is provided space for 2 robots. A robot has space for more than 100 recipes. It is equipped also with a remote control unit. The way this machine is built, it allows blasting of two or three doors/frames at once. The conveyor is driven by the robot so he can manipulate with the items in the way that they are in good position for him. Blasting is done with two blasting nozzles so we can get as much coverage as we can. At the end of the process when the conveyor is travelling back to the rotation unit the robot is air cleaning the doors.